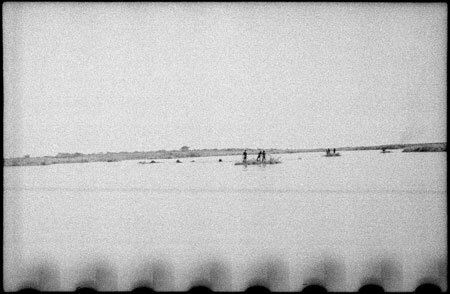 Looking across a lagoon towards a number hippo with several Nuer punting towards them on a floating raft of vegetation. Another group doing the same thing from beyond can just be made out. Thesiger wrote that the Nuer prized hippopotamus meat for its fat content, and he occasionally shot a hippo to provide his porters with a treat. Morton, Chris. "Nuer hippo hunt" Southern Sudan Project (in development). 03 Jan. 2006. Pitt Rivers Museum. <http://southernsudan.prm.ox.ac.uk/details/2004.130.32845.1/>.